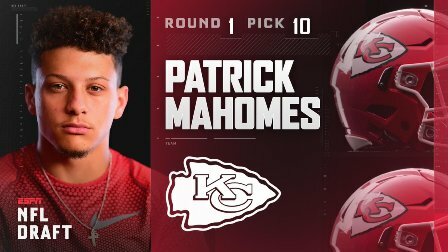 Patrick Mahomes was the result of a massive NFL Draft move by the Chiefs where they traded up 10 picks in the first round to choose Mahomes. He was a Texas Tech phenom with 11,252 passing yards and 92 touchdown passes. In a single game vs Oklahoma in October of 2016 Mahomes set an NCAA record by putting up 819 total yards of offense in a single game. Patrick only played through his junior year after which he opted to enter the NFL Draft in 2017. Patrick was also a top tier baseball player at Texas Tech and was drafted 37th by the Detroit Tigers in the MLB. His father, Patrick Mahomes Sr. played professional baseball for several years with the Minnesota Twins among other teams. Patrick Mahomes was only the second quarterback in Chiefs history to be selected in the first round of the NFL Draft, the only other being Todd Blackledge of the 1983 NFL Draft. Kansas City Info - All Content Copyright 2011 by American Entertainment Solutions, LLC.